Look, we know it’s annoying to be constantly falsely accused of conducting a ‘War on Women’, but aren’t you overcompensating just a touch? 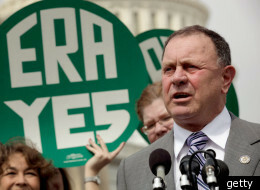 As the only Republican Congressman at a rally for the Equal Rights Amendment on Thursday, Rep. Richard Hanna (R-N.Y.) gave women an unexpected piece of advice: Give your money to Democrats. Hanna is a pro-choice Republican, making him a pro-abortion, government funded contraception hawk, and thusly a man in the front lines in a ‘War on Children’. Congratulations Richard Hanna, you speak for loons, that must make you so proud. When HuffPost asked Hanna after the rally whether he was bucking his party by encouraging women to give their money to “the other side,” he said that he wasn’t.